What’s in the box? Lettuce mix, zucchini, new potatoes, Red Russian kale, berries for the large shares and..
We never wash basil, it turns it black! Some of it might be a little dirty. Rye was trying to l wipe off each leaf while we harvested, but that’s a bit time-consuming. Wash right before using! For some reason golden beets taste less beety to me. And they are one of my favorite colors. 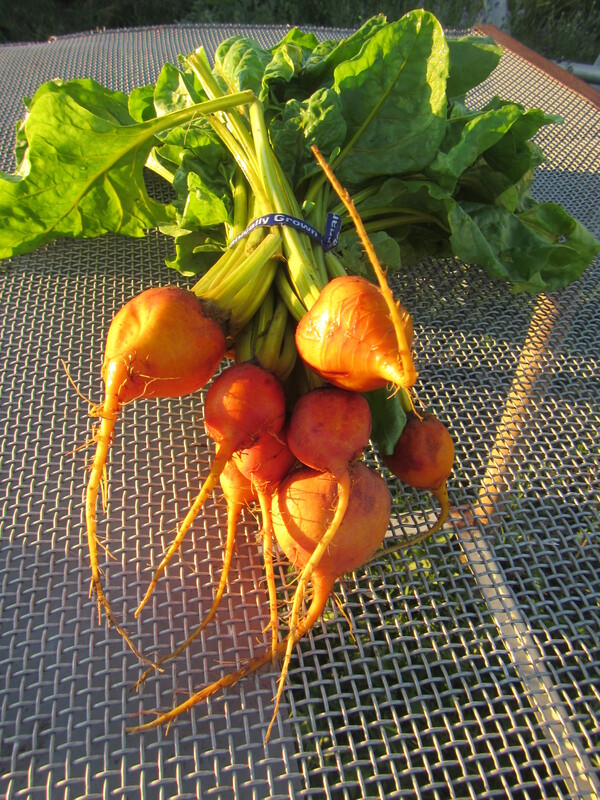 The tops of these beets are amazingly tender, you could use them raw in a salad. 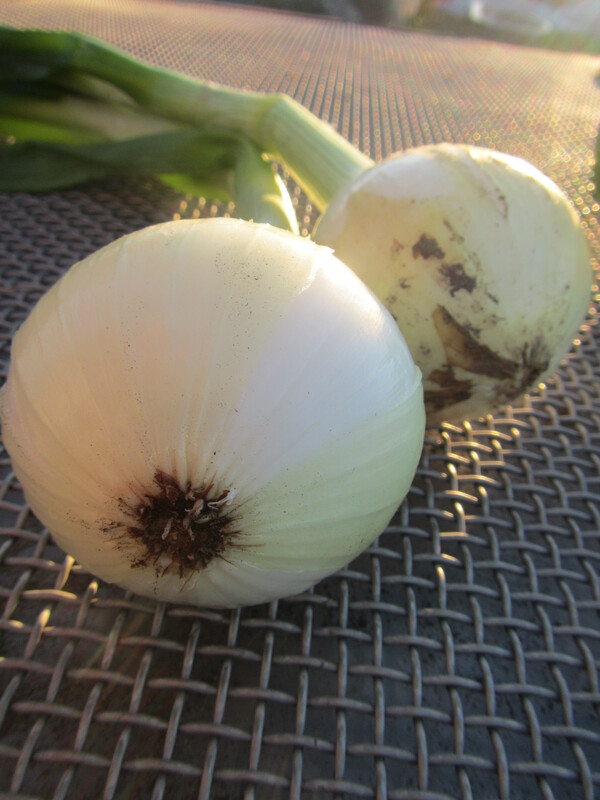 Many of you know these as Walla Walla onions, we cannot call them by that name since Walla Walla’s only grow in Walla Walla, Washington. Some name protection gig. So we call the onions we grow from Walla Walla seed Walla’s. These little seeds were started at the end of January in our house, then individually transplanted out into the field in April and blanketed with grow cloth. It’s a long process. Six months later, voila, you have an onion. 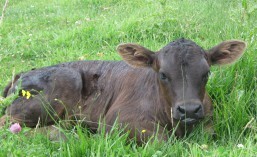 These are still a little young, they will get bigger as the season progresses. Since these onions are not cured (they were just pulled out of the ground on Tuesday) they will store best in the fridge. They are best used within the next week, more are coming. Romanesco superficially resembles a cauliflower, but it is chartreuse in color, and its form is strikingly fractal in nature. The inflorescence (the bud) is self-similar in character, with the branched meristems making up a logarithmic spiral. In this sense the bud’s form approximates a natural fractal; each bud is composed of a series of smaller buds, all arranged in yet another logarithmic spiral. This self-similar pattern continues at several smaller levels. The pattern is only an approximate fractal since the pattern eventually terminates when the feature size becomes sufficiently small. 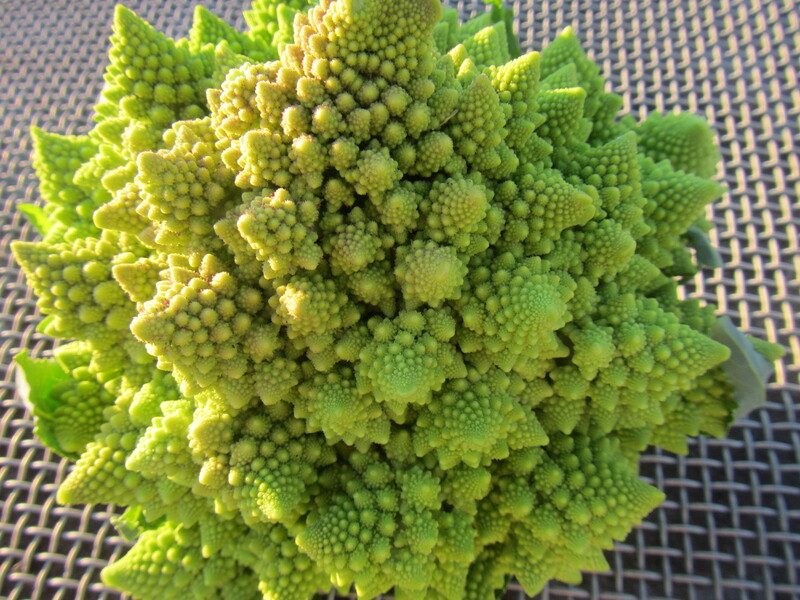 The number of spirals on the head of Romanesco broccoli is aFibonacci number. Use romanesco as you would cauliflower. Native to Europe, wild cabbage can still be found in its headless form that was known to be a source of food for ancient Egyptians, Greeks, and Romans. In Greece, the origin of cabbage was attributed to Zeus working himself into a sweat trying to explain two conflicting prophecies. 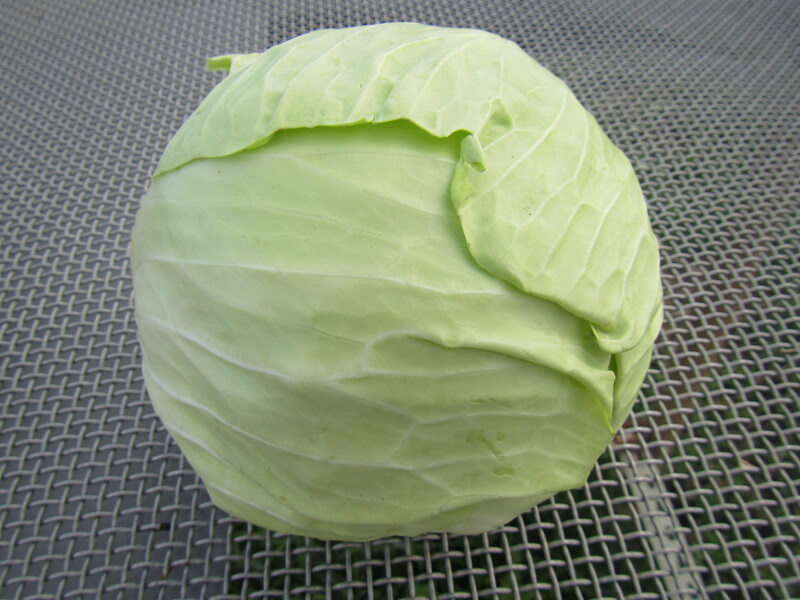 Through years of cultivation, cabbage was developed into the large heads we are familiar with today. Of course cabbage can be turned into sauerkraut and makes for some great coleslaw, but this versatile vegetable also takes well to cooking, whether it is sautéed, braised, boiled, or grilled. Cooking cabbage gives off a pungent smell that is a result of a high concentration of sulphur compounds in the vegetable. The combination of thin slicing and brief cooking times can alleviate the strong flavor. Green cabbage pairs well with butter, olive oil, sour cream, cheddar cheese, parmesan, mustard, horseradish, caraway, dill, marjoram, potatoes, apples, apple cider vinegar, and lemon juice. Cabbage can last for a long time stored in a plastic bag in your vegetable crisper but its nutritive value decreases with time. Remove any wilted leaves before using. Peel away the dark green outer leaves of the romanesco. 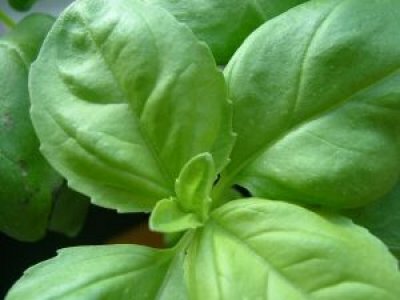 (The leaves are edible and quite flavorful; try sautéing them in olive oil.) Using your hands, gently break the entire head into small, bite-sized florets. Spread them on a baking sheet, drizzle with 4 tablespoons olive oil, sprinkle with ½ teaspoon salt and a few grinds of pepper, and toss to coat each floret. Bake for about 15 minutes, or until the florets are tender all the way through and a little caramelized around the edges. Meanwhile, in the bowl of a food processor fitted with a metal blade, combine the garlic, lemon zest and juice, cilantro, remaining 1 tablespoon olive oil, and ½ teaspoon salt. Blend until smooth. In a large bowl, toss the roasted romanesco with the salsa verde and the olives. Taste for seasoning, adding another pinch of salt if needed. Serve warm or cooled to room temperature. The romanesco is also delicious chilled overnight and eaten for lunch on the following day. Rinse the beets and cut off the greens, saving them for another use. Rub the beets with the olive oil, wrap in foil and place on a baking sheet (in case they leak). Bake until you can pierce through the middle of each beet with a knife, about 1 hour. Remove from the oven and let cool. While the beets are cooking, gently bring the vinegar to a boil in a small saucepan over medium heat until it is reduced by a third. Remove from the heat and let cool. When the beets are cool, use a paring knife to remove the skins, which should peel off easily. Cut each beet into thin slices using a sharp knife. Sprinkle them with salt and toss them in the reduced vinegar. Toss the mâche with the walnut oil and a few grinds of pepper. Top the mâche with the beets, walnut pieces and cheese. Use a spoon to drizzle the remaining vinegar on top, as desired. Serve immediately.